The aim of Sentiment Analysis is to define automatic tools able to extract subjective information from texts in natural language, such as opinions and sentiments, in order to create structured and actionable knowledge to be used by either a decision support system or a decision maker. Sentiment analysis has gained even more value with the advent and growth of social networking. Sentiment Analysis in Social Networks begins with an overview of the latest research trends in the field. It then discusses the sociological and psychological processes underling social network interactions. 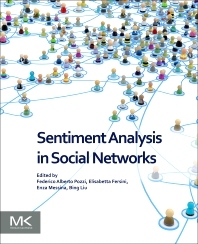 The book explores both semantic and machine learning models and methods that address context-dependent and dynamic text in online social networks, showing how social network streams pose numerous challenges due to their large-scale, short, noisy, context- dependent and dynamic nature. 6 How Can Social Network Analytics Improve Sentiment Analysis on Online Social Networks? Dr. Federico Alberto Pozzi received the Ph.D. in Computer Science at the University of Milano - Bicocca (Italy). His Ph.D. thesis is focused on Probabilistic Relational Models for Sentiment Analysis in Social Networks. His research interests primarily focus on Data Mining, Text Mining, Machine Learning, Natural Language Processing and Social Network Analysis, in particular applied to Sentiment Analysis and Community Discovery in Social Networks. He currently works at SAS Institute (Italy) as Senior Solutions Specialist - Integrated Marketing Management & Analytics. Dr. Elisabetta Fersini is currently a postdoctoral research fellow at the University of Milano - Bicocca (Italy). Her research activity is mainly focused on statistical relational learning with particular interests in supervised and unsupervised classification. The research activity finds application to Web/Text mining, Sentiment Analysis, Social Network Analysis, e-Justice and Bioinformatics. She actively participated to several national and international research projects. She has been an evaluator for international research projects and member of different scientific committees. She co-founded an academic spin-off specialized in sentiment analysis and community discovery in social networks. cation and clustering models that finds applications in different domains such as systems biology, e-justice, text mining and social network analysis. cial Intelligence from the University of Edinburgh. His current research interests include sentiment analysis and opinion mining, data mining, machine learning, and natural language processing. He has published extensively in top conferences and journals, and is the author of three books: Sentiment Analysis and Opinion Mining (2012), Web Data Mining: Exploring Hyperlinks, Contents, and Usage Data (first edition, 2007; second edition, 2011), and Sentiment Analysis: Mining Opinions, Sentiments and Emotions (2015). Two of his papers received 10-year test-of-time awards from KDD, the premier conference of data mining and big data. His research has also been cited on the front page of the New York Times. He currently serves as the Chair of ACM SIGKDD, and is an Fellow of ACM, AAAI, and IEEE. Best book to learn Opinion Mining.